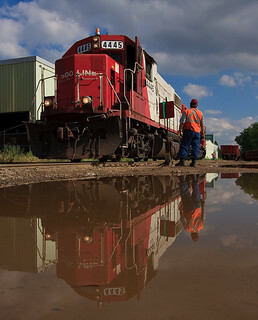 The Camden Job is one of the most desirable assignments on the railroad. According to the other foam in the area, the brakeman, conductor, and engineer are each a few months short of retirement; it takes a lot of seniority to get a cushy gig like this. Thank goodness the sun finally came out, as you can tell, we've had a good amount of rain in the last few days. This shot was used as the back cover for the Fall 2010 issue of THE SOO.